We’re looking ahead to Spring – Aix en Provence for the Easter Festival. 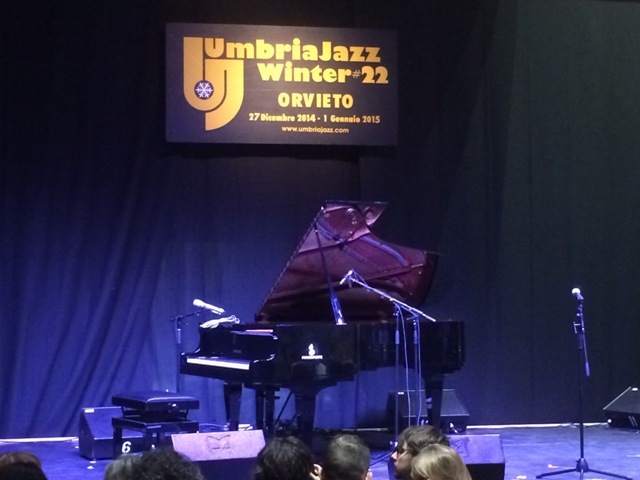 Umbria Jazz Winter is now in its 25th year, filling the hilltop town of Orvieto with jazz all hours of the day and night. This marvelous town, halfway between Rome and Florence, is a joy any time of year, but especially delightful during this winter festival – jazz drifts through the doorways of bars and cafes, bundled up fans and families linger in the piazzas, sample a chewy nut from the chestnut vendor while sipping mulled wine, stroll the lanes during the evening passeggiata, pausing to greet friends, showing off holiday gifts of new cozy coats, follow the Tuscan troubadors Funk Off as they march through the streets twice a day – it’s all so much fun! It’s been 15 years since the first time we came, and my most vivid memory of that first year, 2002, is the New Orleans Jazz band strutting through the streets. The current marching jazzmen have been leading the parade for 14 years now – at noon and at 6. The town goes to sleep for the winter, from what we’ve been told, after Umbria Jazz Winter, but it’s lively as ever right now – the florist under the arcades doing a brisk business, shop windows and entries showing off their best New Year’s Eve attire – the most beautiful boutique in town is esconced in a gorgeous old palazzo. 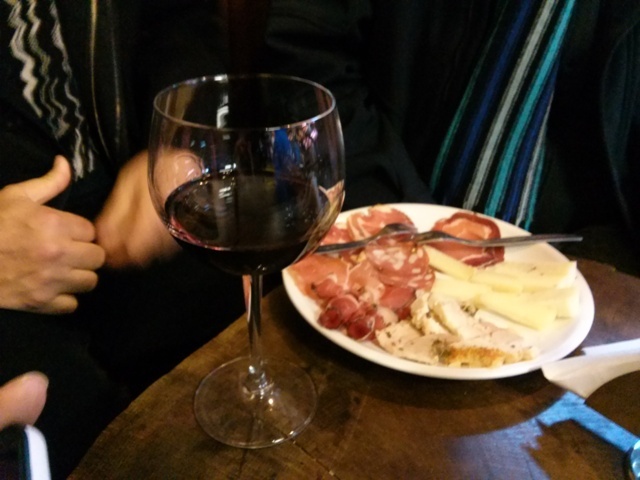 Ready for a bite to eat, we grab a stump-table at Cantina Foresi, beside the majestic Duomo, and order the soup of the day and a platter of Umbrian tastes – superb as always! Hotel Palazzo Piccolomini is the perfect historic-center location to really feel a part of Umbria Jazz Winter – each year some of the musicians stay there, making our breakfast and aperitif conversations quite memorable for both us and our tour guests. This year a legendary bass player, Henry Grimes from New York, and his wife, were a pleasure to talk to – and passed on a CD recorded with Henry’s trio in the renowned Village Vanguard where some tour clients took us last year! On our way to check out the sunset from our hilltop perch, we pass through quiet lanes, and there it is – a beauty! The pink hue spreads from west to east, where the cliff edge reminds us how high we are. 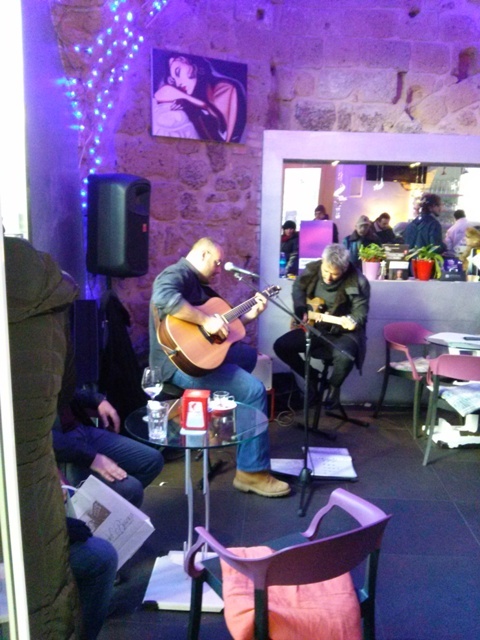 Another strut through town with Funk Off, another delicious Umbrian meal, just one more stroll through beautiful Orvieto, and we say goodbye til next years’ Umbria Jazz Winter. 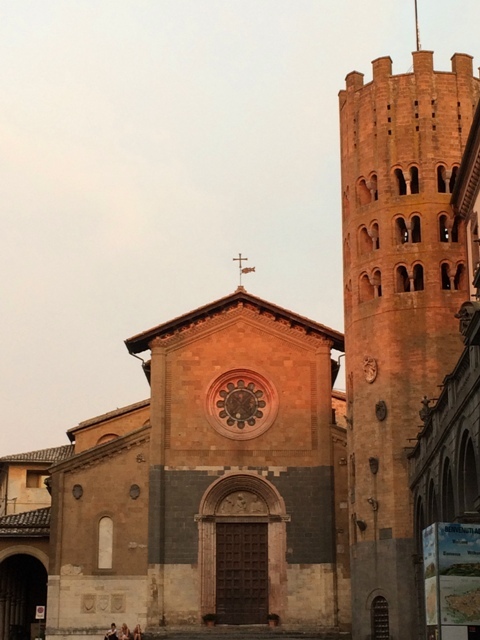 Orvieto – Charm on a Hilltop! How about celebrating Mozart in the matchless city of Bath, England in November? 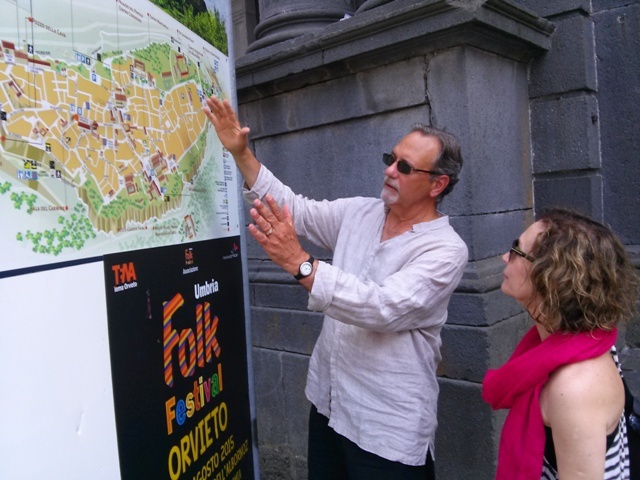 We’ve left the seaside behind, and after dropping off 2 of our guests at the Naples train station, we’re on our way to Tuscany, passing gently rolling fields on our way to the first stop, Orvieto. 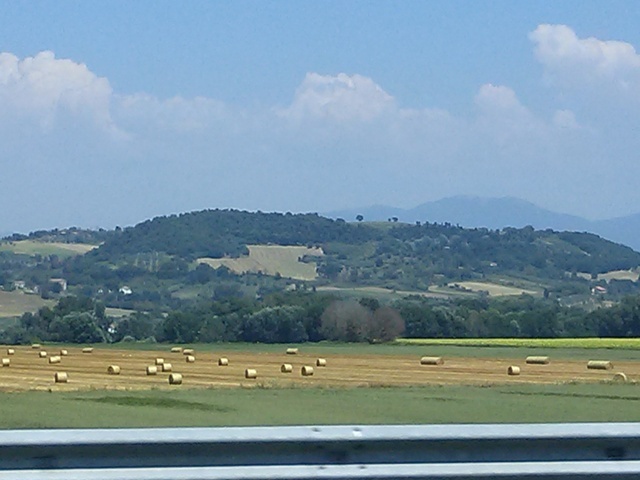 No, not quite in Tuscany, but in neighboring Umbria the “Green Heart of Italy”. A minimum of four hours driving, which is what it takes from Maiori to here, is enough for one day – we’ll complete the journey to Tuscany tomorrow. And of course we’re ALWAYS happy to include hilltop Orvieto in a tour itinerary! 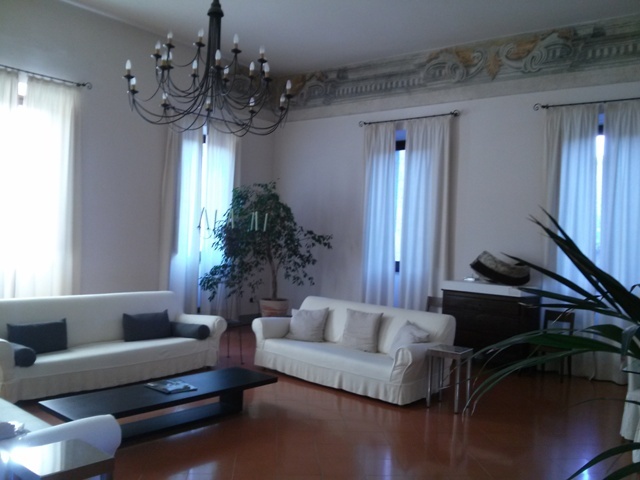 Dropping our bags and the car at the lovely Hotel Palazzo Piccolomini, we begin to show off this marvelous town. The glorious Duomo was uncovered when we were here for our New Years Jazz in Italy Tour (which we’re offering again this year – come along!) 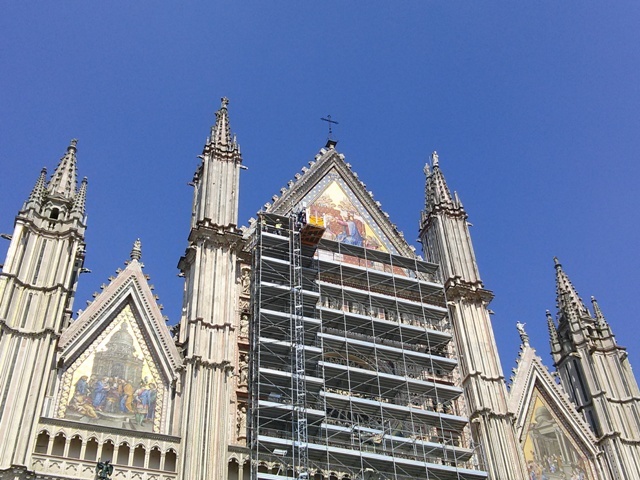 but once again part of the triptych facade is under restoration – often necessary! 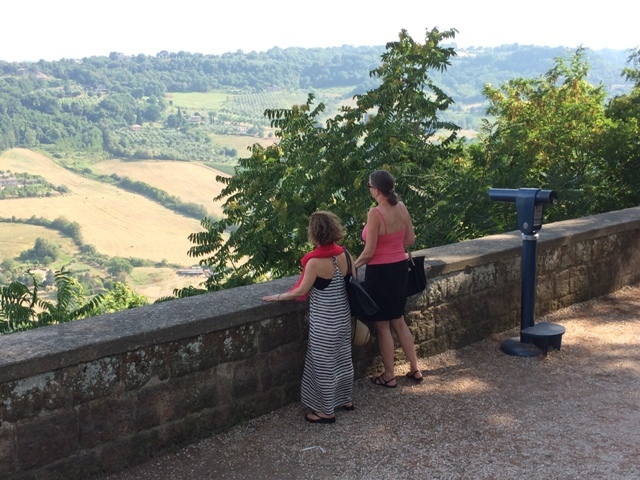 We watch workers coming up and down in the bright yellow elevator, then walk over to the nearby cliffside for a breezy view off the side of the pinnacle that is Orvieto. 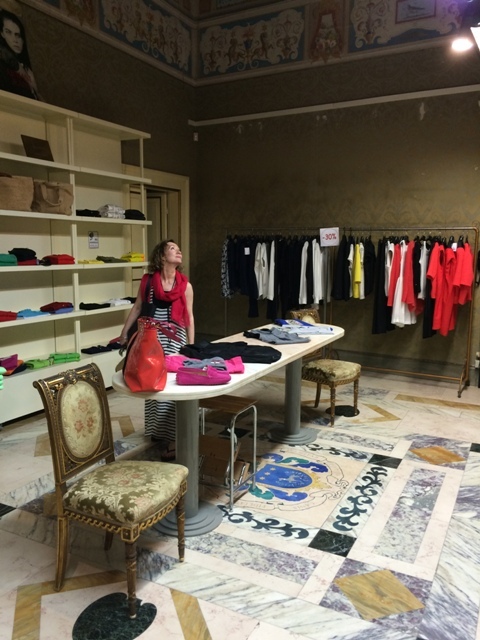 A few shops call our name as we walk back to the hotel…one, a high-end clothing boutique, is in a remarkable palazzo. The building’s more gorgeous than the clothes! 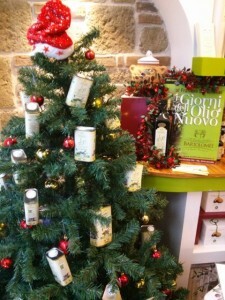 Of course we have to stop at Bartolomei’s in-town shop – remember our trip to their farm in December? The link above tells about that day. A tasting, and a tin or two to take home…as usual, our souvenirs of this trip will be edible – we’re getting low on Bartolomei’s superb olive oil and it’s time to restock! 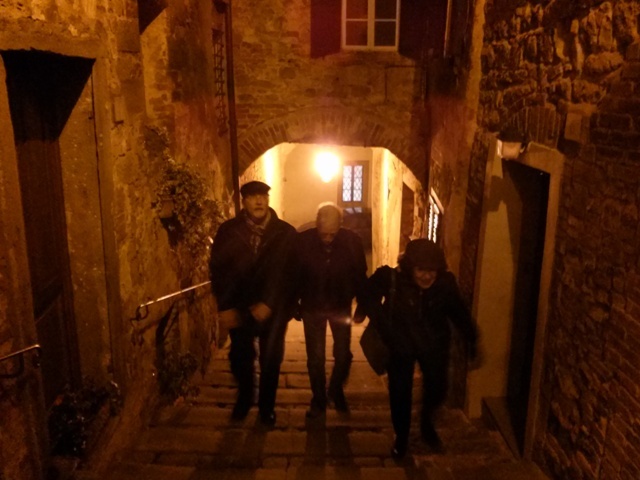 After a rest break in the hotel, it’s time for dinner, and a stroll through the quieting streets as the lowering sun tints the stones in Burnt Umber – so THAT”S where that crayola color came from! 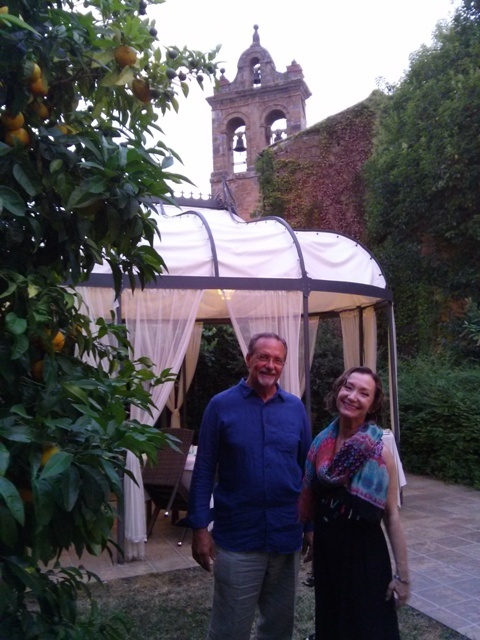 It’s been a few years since we’ve been in Orvieto in the summer, and we’re eager to enjoy our dinner in the garden – when we’re here for New Year’s Jazz in Italy, it’s WAY too cold to be outside! 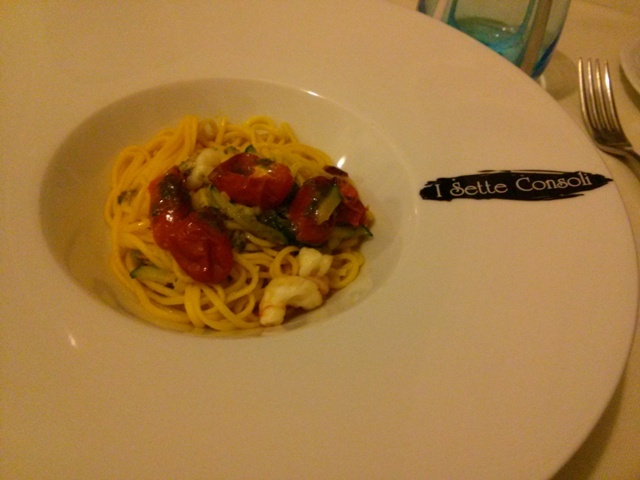 The multi-course feast at Sette Consoli is, as always, exceptional… especially when relished in such a lovely location. 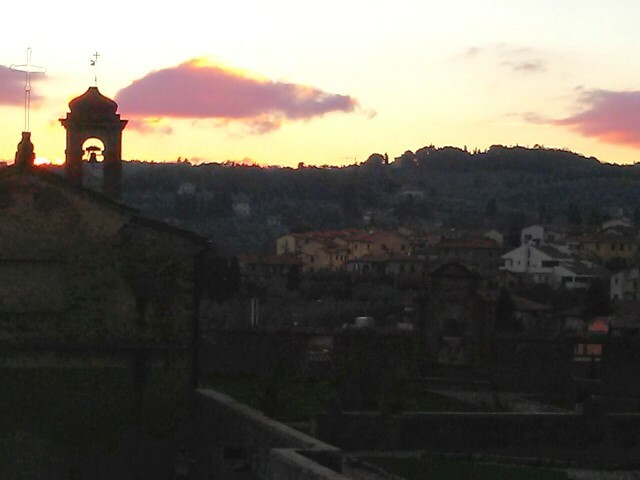 Good night, Orvieto, what a pleasure to see you again! 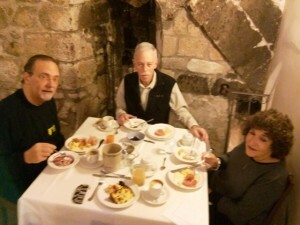 A lazy start to 2015 after our late night…we wander down to breakfast, through Palazzo Piccolomini’s simply elegant sitting room, and join a few late-rising musicians for coffee in the vaulted basement. Look through those alcoves in the wall to earlier centuries, remnants of Etruscan civilization over which the papal palace (Piccolomini was Pius II) was built. We’ll squeeze in one more concert, Davell Crawford, whom we heard a couple of nights ago in duet with Jon Batiste. Today it’s just him on the billing, but he calls up several friends throughout the hour – one guy on a harmonica, a seasoned gospel sister on vocals – as he keeps our toes tapping with classic jazz, rhythm and blues, pop and funk. In exuberant style, he mixes the music with heartfelt tales – of last night’s New Year’s phone call from godmother Roberta Flack, before sharing his memorable take on “The First Time”. What a superb way to kick off the New Year! Before packing up and getting on the road we stop for a quick lunch at Cantina Foresi, beside the Duomo. Alessandro carries on the fine family tradition (the cantina was started by his grandfather in the ’50s) with a warm welcome and platters of delicious Umbrian salumi to go with steaming bowls of minestrone. 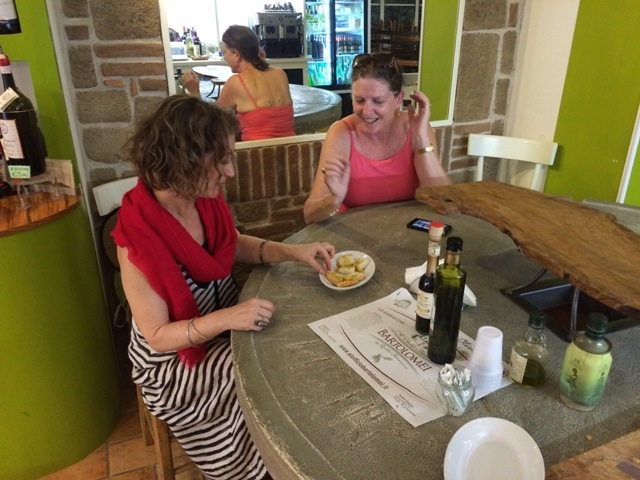 As we walk back to the hotel, jazz drifts through the doors of one café after another, and we stop at Bartolomei’s shop for our olive oil – yes, we can fit a bit more in our suitcases! 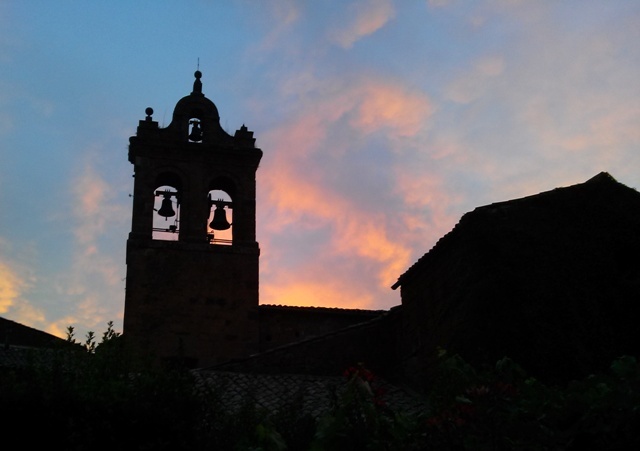 We arrive at our next hilltown, Monte San Savino, with time to check in to lovely little Logge dei Mercanti, settle into our rooms, and take in the sunset from our windows. 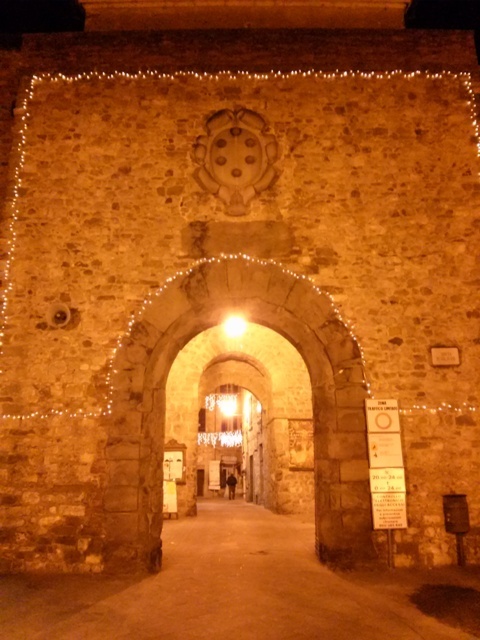 Dinner takes us through the impressive portal of another tiny hill town, Lucignano. We explore a bit, wandering the steep streets of this snail-shaped charmer, and then continue our Italian feasting at Il Goccino. 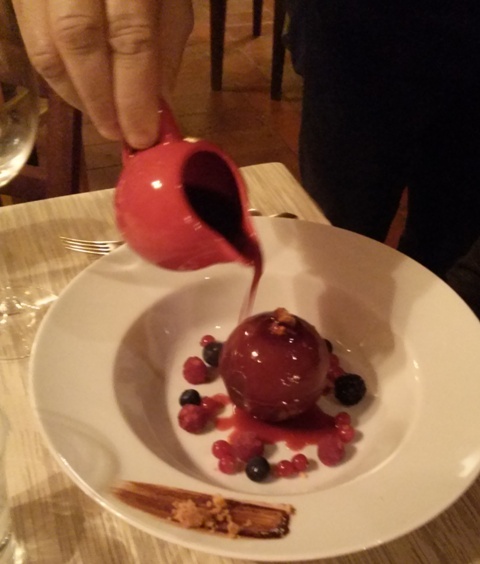 A WOW of a meal, from the smoked goose breast and foie gras, to a “Chocolate Pearl” that melts when our waiter pours on the hot raspberry soup. 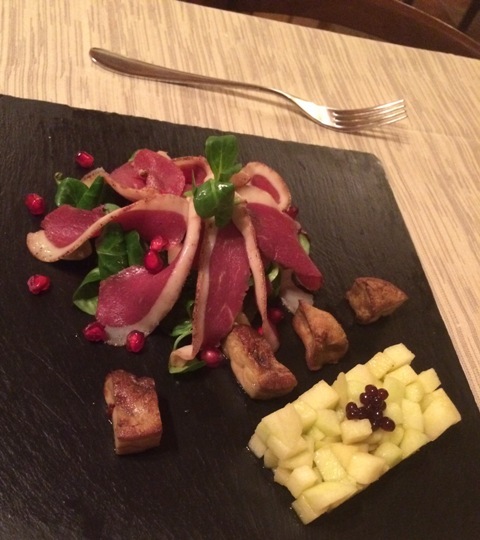 Oh we eat SO well out in the Tuscan and Umbrian countryside! 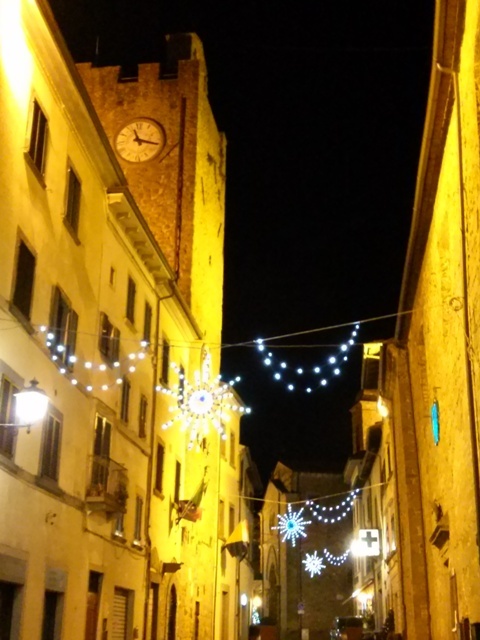 Back to “our” hilltown – Buona Notte Monte San Savino, it’s nice to be back!